The Chinese term kung fu isn't just about martial arts history, as it describes any individual accomplishment or refined skill that is achieved after hard work. In that sense, the actual term kung fu can be used to describe any skill obtained in such a manner, not just those of the martial arts variety. Still, kung fu (also called gung fu) is widely used to describe a significant portion of the Chinese martial arts in the contemporary world. In this sense, the term is representative of highly varied martial systems that are somewhat difficult to trace. This is something that sets the Chinese arts apart from the majority of martial arts systems, where a clearer lineage is often known. It would also seem important to add that the Chinese martial arts have long held philosophical and spiritual significance within the culture. Along with this, the Chinese martial arts grew alongside the ideas of Confucianism and Taoism during the Zhou Dynasty (1045 B.C.- 256 B.C.) and beyond, not in isolation from them. For example, the Taoist concept of Ying and Yang, the universal opposites, ended up being tied in a large way to the hard and soft techniques that make up what is kung fu. The arts also became a part of the concepts of Confucianism, as they were tied to the ideal things people should practice. Which is why it is very important to talk about Buddhism in terms of kung fu. Buddhism came to China from India as relations between the two areas grew during the years 58-76 A.D. In accordance with this, the concept of Buddhism grew more popular in China as monks were sent to and fro between the countries. An Indian monk by the name of Bodhidharma is particularly mentioned in the martial arts history books. Bodhidharma preached to the monks at the newly formed Shaolin Temple in China and appears to have changed not only their way of thinking by fostering concepts such as humility and restraint, but also may have actually taught the monks martial arts movements. Though the latter is disputed, one thing appears clear. Once Bodhidharma arrived these monks became famous martial arts practitioners that worked extremely hard at their craft. At the same time, Taoist monasteries in the area also continued, teaching different styles of kung fu during the same era. Initially, kung fu was really only an elite art practiced by those with power. But due to occupations by the Japanese, French, and British, the Chinese began to encourage martial arts experts to open their doors and teach what they knew to the native masses in an effort to expel foreign invaders. Unfortunately, the people quickly found out that the martial arts could not repel the bullets of their adversaries. Kung fu is primarily a striking style of martial arts that utilizes kicks, blocks, and both open and closed hand strikes to defend against attackers. Depending on the style, kung fu practitioners may also possess knowledge of throws and joint locks. The art utilizes both hard (meeting force with force) and soft (using an aggressor's strength against them) techniques. 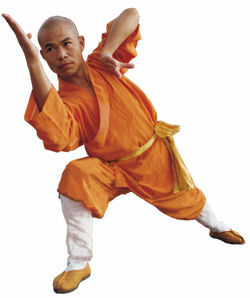 Kung fu is widely known for its beautiful and flowing forms.